A British reporter in Berlin attracts offers from all sides while Hitler prepares to gobble up Czechoslovakia. Freelance correspondent John Russell does not think he believes in much. Once a communist, he now has no illusions about them or about the Russians. What little British patriotism he might have had was shed in the trenches during the Great War. Now in his early 40s, he is divorced from his German wife and dating a smart and cynical actress. Russell’s soccer-mad young son, Paul, to whom he is devoted, is a member, like other kids his age, of the Hitler Youth. The reporter knows that there will be war, but he has counted himself out of it, placed on the sidelines by family relationships. He intends to stay in the country and city to which he has become accustomed, staying out of trouble, seeing Paul as much as possible until his inevitable forced exile. But trouble finds him. First, a friend from the British embassy offers him some extra income, teaching English to a couple of young Jewish girls whose family, the Wiesners, hope to send them to England before the Nazi terror escalates. Then Russell is approached by the Russians, who want him to do a little PR to smooth the way for the upcoming deal between Stalin and Hitler. Russell knows that the assignment must lead quickly to espionage, and he is reluctant to agree. But his admiration for his young students and their desperate family and his disgust for National Socialism and its loathsome believers begin to wear away at his avowed neutrality, and he agrees to act. Filling the British in on every move, the once-neutral reporter is, within weeks, a full fledged spy and, at the same time, the only hope for the Wiesner girls, their firebrand brother and their frantic mother. 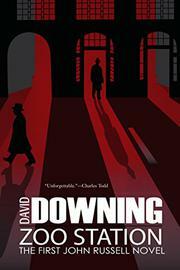 Smooth, scary wartime thriller drenched in period atmosphere, from Downing (The Red Eagles, 1987, etc. ).